RICHARD ARSCOTT LEE, was baptised at Saint Mary Steps, Exeter. He was the fifth child of Richard Lee and Sarah Gay. Aug 19. Richard Arscott, son of Richard & Sarah Lee. Ewings Lane. Mason. Ewings Lane lay under the west walls, in the poorest quarter of the city. Richard and his family survived the cholera epidemic of 1832, though half his siblings died in infancy. He was apprenticed on a farm in Bridford. There seems to have been a previous family connection with this parish, since his father gave Bridford as his birthplace in the census, though he was in fact christened in Doddiscombleigh. Unlike Cornwall and Somerset, Devon has only two place-legends associated with King Arthur. On the plateau above Laployd two granite tors stand two miles apart. Heltor, or Whitestone, overlooks Dunsford, and Blackingstone Rock, or Blackstone, overlooks Moretonhampstead. The story goes that this is the site of a stoning match between Arthur and the Devil. The Devil took his stand on Heltor, while Arthur hurled his rocks from Blackstone. Laployd stands high up, to the east of Blackingstone Rock. It is a substantial stone and thatch farmhouse with some magnificent granite barns. 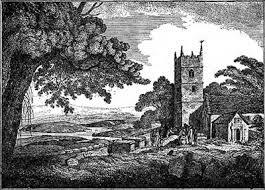 The Travellers Guide: Devonshire mentions only one place of note at Bridford besides the church, Laployd Barton: ‘an ancient house built of moor stone. The centre part of the building may be the original home of the Lapflodes, who lived here until 1523; but at each end are later extensions.’ It was clearly a substantial farm in Richard’s time, from the number of apprentices. There would probably have been older labourers, married and living out. The maiden name of George Brook’s wife, Mary, was Palk. This is the name of the family who owned the Haldon estate and built the tower of Haldon Belvedere. They also owned land in Bridford parish. Charles Medway gave evidence of what a farm apprenticeship meant for the previous generation. 2 Charles MEDWAY labourer of Doddiscombsleigh, bc 1800 Bridford. ” I was born at Bridford. My father and mother were farm-labourers….. .I was apprenticed to Mr Smallridge of Bridford. (at 8 or 9) ..at six years old to fetch cows, water etc. My master died a year before my time was out. I served the rest out with his widow. The boys (apprentices) lodged with the masters sons, in the same room. The girls (apprentices) slept in another room with the masters daughters. the children are better off if in a good place…”. Mary Puddicombe had a mixed experience. “My father was a farm labourer at Bridford. I am 41. I cannot read or write. I was apprenticed to Matthew Coleridge of Bridford when I was nine years old. …. The family got their dinner all together, and supper too…… There was no difference in the meat and we always had wheaten pudding……I used to be employed when I was apprenticed in driving bullocks to the field and fetching them in again; cleaning out their houses and bedding them up; washing potatoes and boiling them up for pigs, milking, in the fields leading horses or bullocks to plough. Maidens would not like this work now…..
Not far from Laployd is the ancient farm of Smithacott, now a roofless shell. In 1841 the Kelly family were farming there. Around 1850 they moved to Lower Wooston Farm, now Great Wooston, high up on the outskirts of Moretonhampstead, above Clifford Bridge on the River Teign and beside the small moor of Mardon Down. About the same time, Richard would have finished his apprenticeship at the age of twenty-one, and he went to work for them. CHARLOTTE HUTCHINGS was born in Moretonhampstead. She was the sixth of eight children of Walter Hutchings, stonemason, and Betty Taverner. She was born 14 September 1827 and baptised in Moreton Hampstead Wesleyan church. Richard Lee’s two eldest brothers were baptised at the Mint Wesleyan church in Exeter, but by the time he was born the Lee family were using the parish church. Charlotte’s family had moved from the Anglican to the Methodist church and remained Wesleyan. Richard and Charlotte’s own children were baptised in the Church of England. In 1823 the lower floor of the Church House, previously used for parish meetings, brewing ale and feasts, was housing poor people rent free. The upper room was a school for ten children. In time a further ten children were taught on the ground floor. Charlotte could write well, but we do not know where she learned. At the age of 14 she was working as a farm servant for Richard Hutchings, probably a relation. Also employed was 15-year-old Walter Hutchings, who is therefore not her brother Walter, but probably a cousin. Her father appears to be already dead and her mother a serge weaver. Ten years later, shortly before their marriage, Charlotte was a servant living in the house of her employer, a smith and a baker in Court Street, near the centre of the town. Court Street. This may be the forge and the bakery. Marriage. July 5th, 1851. Parish church, Moretonhampstead. Richard Lee. Full age. Bachelor. Labourer. Cross Street. Charlotte Hutchings. Full age. Spinster. Servant. Cross Street. Signed: The mark (X) of Richard Lee. In the presence of: Mary Shears, Robt Tremlett. Richard is illiterate, but Charlotte signs with an assured adult hand. After their marriage, Richard and Charlotte led the life of so many labourers in the 19th century, with frequent changes of employment and homes. 6th May. William Hutchings, son of Richard & Charlotte Lee. Town. Labourer. William Hutchings Lee died early. Indeed, there may have a second unrecorded son. 1853 William Hutchings Lee. Moor Wood. 17th July. 5 Months. The Lees had moved from the town itself. Moor Wood is down the Bovey Tracy road. There isn’t a farm of that name now, but Moor Barton lies over the hill behind it, to the east. They were still living there when their next son was born. 2nd March. George, son of Richard Arscott & Charlotte Lee. Moorwood. Labourer. Farming was in decline, but other possibilities were opening up. Plymouth’s docks were expanding. The family moved to St Budeaux, then a village north of Plymouth, above the Tamar. Richard worked sometimes as a farm labourer, sometimes at other labouring jobs. 1858 July 18 William. Richard and Charlotte Lee. St Budeaux. Labourer. Feb 6th. George Lee. St Budeaux. Yrs 3. May 19. Richard. Richard & Charlotte Lee. St Budeaux. Labourer. Charlotte was now taking in lodgers to help the family income. In the 1860s, Richard left farming for another sort of labouring, probably at Devonport dockyard. 1865 October 1. Elizabeth Maria. Richard & Charlotte Lee. St Budeaux. Labourer on Govt Works. 1867 May 19. Charles. Richard & Charlotte Lee. St Budeaux. Labourer on Ports. 1869 July 11. Emma Charlotte. Richard & Charlotte Lee. St Budeaux. Labourer on Ports. On Boxing Day 1883, the Western Morning News urged its readers to think of those who had to work over Christmas. It then drew attention to the plight of those, like Richard Lee, who might wish they could work. But there is yet a class of men to whom Christmas comes as a heavier burden than to any of those previously spoken of. It is the men who, earning the barest possible pittance, are compelled to abstain from work, and to keep a holiday at the cost of a day’s pay. Take a pick and shovel labourer, for instance, who has to maintain himself and a wife and half a dozen children upon a princely allowance of 4½d an hour, and who was mulct yesterday to the tune of about 3s 4d because humanity in general was taking a holiday and feasting itself. Does anyone suppose that a man under those circumstances ‘keeps’ Christmas? One might as well expect him to bring up his family on nectar and ambrosia. We asked a labourer who is employed for nine and a half hours daily in hauling stones to the top of a new public building in Plymouth, and whose remuneration is at the rate named, whether he did not rejoice at the prospect of a holiday. The holiday was well enough, sure, was the reply, but the loss of wages meant that the family would have to go short of victuals at some time or another to make up the deficiency. In fact the man hinted a wish that he could work on Sunday. Shocking, some people who sat down to their turkey with a sherry yesterday would exclaim, but the man was right in one respect. Christmas was no boon to him, rather did it rob his family of bread, and make one day the less on which he could earn his 3s 4d during the hard winter months. We are not moralising; these are the facts, and the same argument applies in a greater or less degree to masons, carpenters, plumbers, and all of those to whom a cessation of work means an ill-afforded stoppage of pay. The following year Richard was back at farm work, and Charlotte was still looking after a lodger. 1871 Census. St Budeaux. Village. Their last child was born. 1872 July 21. Louisa Alice. Richard & Charlotte Lee. St Budeaux. Labourer. Louise seems to have died in infancy. Their sons joined the navy. Elizabeth became a dressmaker. Other occupations in the village are: Labourer, parish relief, 2 shoemakers, ag labourer, dockyard labourer, charwoman, ag. labourer, mason, ag labourer, dockyard lab, pensioner/army caretaker, ag lab, dressmaker (who could be the apprentice Elizabeth’s mistress), mason, soldier’s wife. A number of people in these households are out of work. Their eldest son William died at Tresco, perhaps at sea, in 1889. There is no record of a shipwreck on Tresco that year. The following year their youngest son Charles was lost in the dramatic sinking of the Serpent. The cruiser HMS Serpent was built at Devonport and launched in 1887. She sailed from Plymouth on 8 Nov 1890, bound for Africa. The next night three seamen were cast up, exhausted and bleeding, on the rocky shore of Galicia, in Spain. In Plymouth, Richard and Charlotte may have been among the crowds who besieged Admiralty House and Devonport Dockyard gates desperate for news of relatives. Hundreds massed outside newspaper offices to read the survivors’ stories. But after them, only wreckage and bodies came ashore. 147 officers and crew were drowned or dashed to death on the rocks. The Spanish buried the bodies they recovered in a nearby graveyard. By now Richard and Charlotte were living alone. 37 St Budeaux Hill. 4 rooms. Richard died the following year. Richard Lee. February 17, 1892. St Budeaux Green. 64 years. 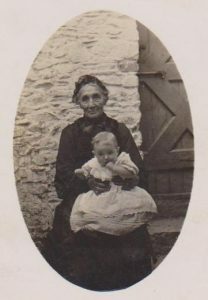 Charlotte with her grandson Edmer Sampson? In the last quarter of 1895, Charlotte remarried, to an elderly widowed labourer. Thomas Cross was born in North Looe (Northlew) NW of Okehampton . He followed a similar career to Richard Lee, moving from the outskirts of Dartmoor to farm labouring on the outskirts of Plymouth, and then into labouring on government works. Honicknowle is to the east of St Budeaux village and Egg Buckland lies further east, beyond Crownhill. 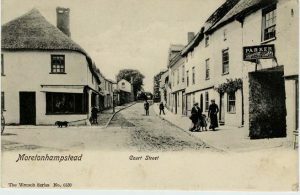 The wedding in 1895 took place in the Plympton registration district, and may have been at Egg Buckland. The couple were living at Agaton Cottages, near St Budeaux Green in 1901. Thomas was still labouring at 74. This was before the Old Age Pensions Act of 1908, which introduced a flat weekly benefit for those whose income fell below a certain amount and who were deemed to be ‘deserving’. “Gt” probably indicates that he was working for the Government in the dockyard. By 1906, Charlotte’s daughter Elizabeth had returned to live on the Green with her second husband John Sampson and the children of both her marriages. Richard and Charlotte’s surviving son Richard had been living in St Budeaux as a chief stoker in the Royal Navy. He also came back to the Green when he retired. Ethel Blanche. Richard & Elizabeth Lee. The Green, St Budeaux. Naval pensioner. Richard Lee. The Green, St Budeaux. Jan 2. 49 years. Charlotte’s second husband Thomas died. His eldest daughter Emma had married Henry Snell. Charlotte went to live with them and their extensive family at 2 Ferndale Avenue in the Stoke district of Devonport. The following year, Charlotte was living at Second Avenue, Camel’s Head, when she died on 7 July 1912. She was buried in St Budeaux churchyard. She is recorded on the same tombstone as her first husband Richard and the name given is that of this first marriage – CHARLOTTE LEE, not as she now was, Charlotte Cross. Probably the tombstone was erected by her surviving Lee children, who perhaps disapproved of this late fling. Thomas’s burial has not yet been found in St Budeaux or Plympton St Mary. It may have been at Egg Buckland. Further on is the grave of Richard and Charlotte’s son Richard, who had served as a chief stoker and whose epitaph has a nautical ring. It may have been this seafaring background which led Edmar Sampson to become a Royal Marine bandsman, rather than join the Army, like his father. The 15th century church at Higher St Budeaux was built to replace one down by the Tamar, the site of the Celtic St Budoc’s original settlement. It stands on the edge of the scarp, overlooking the Hamoaze, the broad anchorage before the Tamar flows into Plymouth Sound, with views across into Cornwall. Around the village green in the 19th century also stood the Blue Monkey Inn, the old church school, which the Lee children may have attended, and Agaton Cottages. The inn is now closed and the cottages and school have been replaced by two modern houses and a church hall. But the green is still there, and the church and its graveyard are an island of tranquillity, just off the new trunk road. Over the church door is a sundial, with the inscription: Ex hoc momento Pendet Æternitas. (On this moment is eternity suspended). St Budeaux Church in the 19th century. Extracts of Evidence to the Special Commissioners inquiring into the employment of women and children in agriculture (reported 1843). In The Farm Labourer Through Four Centuries.